Old hardware is just like everything else in an old house, covered with decades of paint. 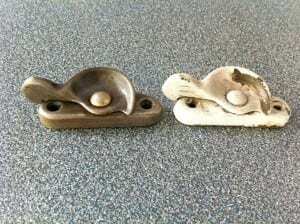 Antique hardware can be some very attractive and beautifully crafted pieces of art that is well worth restoring. If you want to remove paint from hardware, you don’t want to just start scraping the paint off with an old screw driver. You’ll gouge the metal and spend hours trying to remove all the paint. To remove paint from hardware, next time try boiling it off. You need to soften up the paint to get it off without scratching the metal beneath. While you can use gooey chemical strippers I prefer the cleaner and simpler time tested method of the crock pot. Take your old hardware and place it in an old crock pot or other pot that you don’t plan to cook in anymore. Fill the pot with enough water to comfortably cover the hardware and add a few tablespoons of baking soda or a little dish soap and let it simmer for 4-8 hrs. When the paint is bubbled and looks like it is just loosely hanging onto the hardware, it’s ready to pull out. Use tongs or pliers to pull the hardware out of the water. Using a stiff bristle nylon brush scrub the paint off the hardware. If the paint won’t come off, it needs to cook longer. Make sure you clean one piece at a time because once it cools and dries the paint won’t be easy to remove anymore. Make sure to dispose of the water and paint residue safely since it likely contains lead paint. When you’re done scrubbing, wait for the hardware to cool and finish polishing the hardware with some 0000 steel wool. 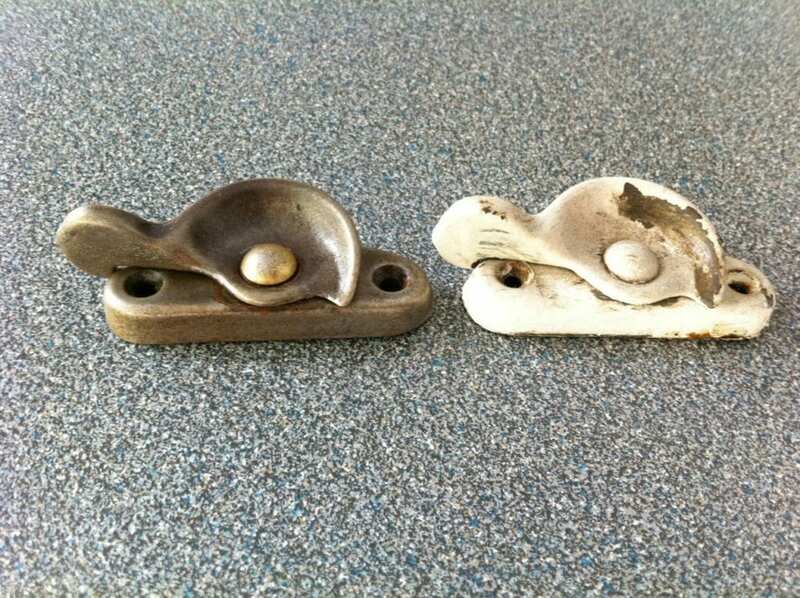 Give it a good wipe down and add a couple coats of spray lacquer and you’re ready to reinstall your new old hardware. Check out the video below to see the whole process in action. Nice post. Great idea & techniques . hope it will help the people a lot. Thanks, Scott! This is a great idea for small pieces. Any thoughts on what to do with large items, that can’t be dropped into a pot? Like beautiful old steam radiators that have years of paint on them? I use the same general technique, but instead of boiling the hardware, I use a heat gun and a dremmel tool with a nylon brush attachment. 15 seconds of high heat will give me 30 seconds of brushing time. It’s slow, but it sounds faster than what you described. For deep crevices, I use a utility knife and am careful not to scratch the surface. Be sure to hold the hardware with pliers and wear leather gloves! I’ve only branded myself once so far by accidentally touching the hot metal. Oh, and be sure to do this in a well-ventilated area, like your driveway. Boiling/burning lead paint probably isn’t the healthiest stuff to inhale. Work at an paint store. Love the ideas to help customers solve their problems . THANK YOU THANK YOU! All the hardware in our home has been painted, sigh. I wanna see the original finish, and had no clue how to get the paint off that didn’t involve some chemicals…this is doable! Good luck with it Leslie! Can’t wait to hear how it turns out.